The new station link between Walthamstow Central and Walthamstow Queens Road is almost open … almost. It’s only taken almost 20 years to happen since it was first touted, and talking to the station staff at Queens Road yesterday, they said it was all “Down to the council digging their heels in with red tape” which had slowed it down. 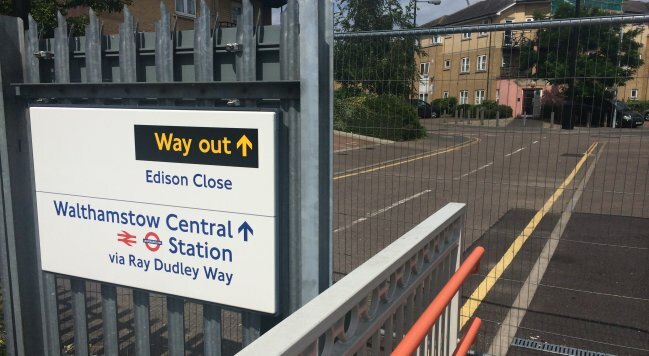 The new ramped entrance at Walthamstow Queens Road has in fact been in place since 2013, and there are articles online suggesting that it would have been open last summer, but instead – it now really looks as if it will open next Monday – 11th August. 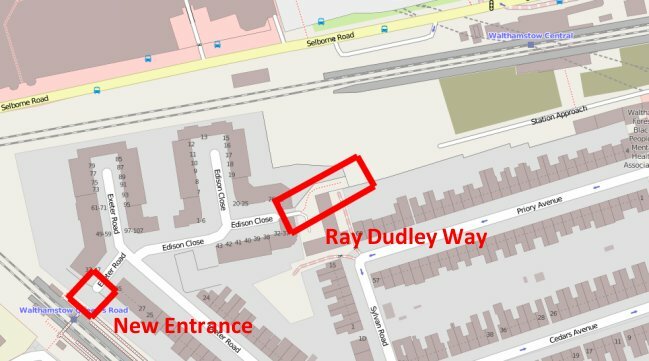 There’s a new footpath through the car park too – which is necessary to form a quick path between the two stations, and it’s been named Ray Dudley Way after a long standing member of Barking to Gospel Oak Rail User Group (BGORUG) who sadly passed away last year without seeing this project come to fruition. But for the geeks amongst us, it means that you’ll be able to change between the Victoria Line and the Overground here in a short 2-3 minute walk instead of the 6-7 that it took previously. This entry was posted on Wednesday, August 6th, 2014 at 8:00 am	and is filed under Infrastructure, Overground. You can follow any comments to this entry through the RSS 2.0 feed. Both comments and pings are currently closed.